The 3rd generation of RDM4 Dis.Tech, measuring a distance faster and more accurate ever. 400m reflectorless range in stunning speed up to 0.3s, and 4km in prism mode with an accuracy up to 2mm+2ppm. One red button independently located on a side covert. Without looking at the screen and finding the right key on the keyboard, Lightning Measure allows you to trigger a fast distance measurement in the next second after you aim at the target, avoiding a possible shake on horizontal direction which might happen if you press on the keyboard. By flashing LED in red and yellow on top of the objective lens, Guide Light will help the pole man to move the prism pole to the stakeout point fast and precisely during stake-out operation. Both vertical and horizontal shafts are embedded more than 100 steel balls, which makes RCS Series rotates smoothly and stably so as to deliver a higher angle accuracy. 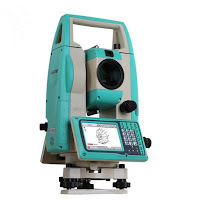 It also essentially reduces the chances of jamming if the total station encounters violent shock and vibration. Instead of going through 3 or 4 steps by pressing several keys and selecting several options, up to 6 number key is like a wormhole allowing you to "jump" to most of the specific functions, settings and programs in one step. You can also customize 2 measuring keys with different measure mode with your preferences, and define 2 number keys as shortcuts to access to your most favorite program or COGO.